Something that I have learned quickly is that if I don’t make a conscious, intentional effort to care for myself, then I have a difficult time caring for my two-year-old son and my husband. This makes sense, doesn’t it? If we aren’t healthy and happy, then chances are we won’t be very effective at breathing health and happiness into our loved ones. So here are some things I do to take care of myself so that Mommy stays a healthy, happy person. I sleep as much as I can, especially when I’m tired, but this almost exclusively has to happen at night. Naps are completely non-existent for me, and I accept that as part of this life. Before I was pregnant, I wasn’t as uncomfortable in the bed and during sleeping as I am now. These days, I find myself getting up at 3, 4, 5, 6 in the morning and just staying up because it’s less uncomfortable than being uncomfortable in a bed when I can’t fall back asleep. This means that I get pretty exhausted after a few days of doing this. But this also means that every few days, I get a good, hard sleep because I’m so exhausted. So it kind of works in my favor and works its way out eventually. Before I was pregnant, the strategy was to sleep when my son slept (during the nursing years, if he ever napped during the day, I napped with him; if he ever naps now, I make a mad dash to get as much done as possible). This meant that if he slept until 10 or 11 in the morning, then I was sleeping with him. I learned not to feel guilty about this, especially since I was the one who woke up at night with him and since I was the one nursing him and since I was the one watching him during the day. I got no other breaks, so this sleeping time was the only time I had to recharge. That was the smartest thing I could have done at that time. I always felt so much better after having slept as much as I could, even though I was always waking up with him (which was later in the day than I would have preferred) and didn’t have much to-myself time. Once I started feeling more refreshed with the sleep I was getting, which was around year one and now more intensified with the pregnancy (even though I wouldn’t say I’m always refreshed now, just ready to get up, even after only a few hours of sleep), I would take advantage of the alone time I would have while everyone else was sleeping to do things for me, like write, read, sit, or work on projects. This time is so very valuable, and it is what keeps me balanced. I scrape off my alone time by getting up after everyone is asleep and by getting up before anyone is awake. During the day, I make attempts to have devotions and read books that are of interest to me. I can’t do it in one sitting, but it gives me something to weave in and out of household duties and childcare demands. I usually don’t do this when I wake up and am alone since I prefer to use my true alone time to write (writing is so much harder for me to do when I can’t do it continuously…I like to have a constant thought process going without too many interruptions). This attention to my spiritual health and growth is the true secret behind any and all success that anyone would say I’ve had as a woman, wife, and mother. God Almighty is the source of my strength. Having an eternal perspective releases me from getting too wrapped up in and sucked into and downtrodden by day after day after day of the same stuff, over and over again, with emotions wearing thin and strength being low. I have learned to lean on the Lord and to receive rest and peace from Jesus as I make my way through each day. I don’t know how non-Christians do it. Frankly, I think they don’t. They can’t. It seems to me that that’s why so many families fall apart and why so many children come from hurtful home environments—this life is hard! And without the help of the Lord, it’s impossible to not only survive it all, but to thrive in spite of the difficulties. What I have found is that I have so much more joy now than I did when my motherhood journey began. I have so much more insight into myself and into what God wants for me. I am a stronger, more confident person who is daily learning more and more about what it means to trust God. He watches over my family, and this frees me up to love him and my husband and son more because I don’t have to worry about anything. He has his hand upon us and is helping us through everything. I take every opportunity I can to rest. So this means that if my son wants me to come with him, even if I’m in the middle of doing stuff in the kitchen, I come with him and use that time to rest, whether I’m sitting on the couch, sitting on the floor, or standing. I’m trying not to hold him as much because it’s hard on my body with the pregnancy, but while I’m making myself as available to him as I can, I am also consciously letting everything else go and just focusing on being with my son (being mindful of being in the present) and on releasing any tension I feel. I have found that I am so tired so much of the time. I think this is to be expected with being a parent (and now with being pregnant again), but tiredness has a very negative effect on me if I don’t take steps to manage it and work within it as much as possible. I am careful to not do too much without ignoring the jobs I need to do and feel like I should do. Even though I don’t have to pack my husband’s lunch or make him tea (staying home with our son is about caring for our son, not doing things for my husband that he can do for himself), I do those things because, in the long run, they make my life easier. It is easier for me to make his lunch and tea, for instance, so that I can keep the kitchen clean and so I can know what’s going on and whether things are being taken care of than to leave my husband’s lunch and tea up to him. I respect what he does for our family, and making his lunch and tea for him is a small but practical way of saying thank you and I love you. Plus, the time that my husband would spend making his lunch and tea would be time that he would be away from our son, and, there’s no need for this if his lunch and tea are already ready. Making my husband’s lunch and tea during the day (as well as doing all the other housework things) gives me the freedom to break these tasks into small components so that I can weave them in and out of caring for my son, similar to what I do with my readings during the day. Furthermore, doing these things for my husband enables all of us to have a more relaxing evening because all (or at least most, if I can help it) of the many responsibilities of home management are out of the way. So on its face, it might seem like I do more than I should, but in reality, I feel that I’m working a wise-woman’s way, doing what I know needs to be done so that I know that it’s done in the first place, that it’s done well in the second place, and that it’s contributing positively to a happy-equilibrium home environment. This is where the need to control has positive implications because our homes can be run well as a result of the diligence we choose to invest in it all. Starting with getting up in the morning, I make sure I keep myself fed. This seems like a given, but it’s tempting to just not eat since it takes time away from doing other things. So if I’m hungry I eat. If I have to go to the bathroom, I go. I don’t wait. I do it now or as soon as I can. I take care of my own needs when I have them so that I don’t break down at inopportune times. I make sure to put on a fresh change of clothes each day to feel fresh. It’s tempting not to do this since I’m just home all day, but I do it anyway because I feel so much better. I don’t worry about dressing nice. I aim for comfort. Comfort is the standard. I make sure to brush and floss my teeth in the morning and to brush at night. I used to skip this if I was ever too tired, but it makes me feel good to take care of myself, so I see these simple times as a practical way to make time for me. It makes such a huge difference I believe. I wear my hair in a simple way these days so that it doesn’t take much time to fix. During the day and around the house, I either twist it into a low bun or put it in a ponytail. When we ever go out, I will put it in a ponytail and clip the sides, or I will wear it half up if I want to look “nicer” than usual. I don’t dry it, curl it, straighten it, style it, or try to wear it completely down anymore. It’s just too much work for me now on top of all the other work I do, it’s too much time to spend that I just don’t have, and my two-year-old son ends up pulling on it anyway. So I keep my hair out of the way so that I can focus on other things. I wear earrings whenever we go out, and I wear make-up and a necklace if we’re going out somewhere special. If I feel like it, I’ll wear make-up at other times, but usually I’m doing the best I can if I just have my teeth brushed. Make-up these days just means one coat of mascara, a colored lip balm, and maybe some powder-foundation. It is not glamour-face time like it used to be before being a mom. I keep my nails short and couldn’t care less about painting them anymore. I make sure to drink water throughout the day. I also make sure to eat as many fruits and vegetables as I can each day, as well as take my vitamins and drink some milk during dinner, without holding myself to a counting chart or anything. If I’m tired, I rest. I don’t ever push through the exhaustion except on occasion if I’m right in the middle of something. Getting the housework done sooner than later allows me to rest sooner than later. I used to space it out during the day and spread my work load out. But I found that I would get super tired in the afternoons, yet I would still have work to do. So I try to do everything as close together as I can so that when the tiredness hits in the afternoon, I can truly just rest. This has been the case more-so during my pregnancy. If I find that I am unusually upset, angry, or frustrated, I try to pinpoint the real reason for it. Usually, all the stuff is rooted in feeling like I’m not in control or in my frustrations about having unmet needs or in my desire to do my things when and how I want to do them. I have learned to talk to myself about all of these things. Self-talk, which should mirror what God’s Word says to us about us and God, has been a helpful tool for me. God is helping me to learn how to stay calm and collected and balanced and even at all times. Meekness is right up this alley, which is the skill of not being easily provoked. I have to be okay with myself before I can be okay with others. Especially when it comes to feeling like I’m not able to get anything done for myself, like write or read or just have time to myself without interruptions, I have learned to accept at face value the fact that my view of “personal time” has to change. So this is where taking time in the mornings (or at night) when I’m up but everyone else is sleeping is so, so important to my overall health and well-being. By taking advantage of these times, it allows me to not be so uptight about not having time to myself during the day and in the evenings, especially since my job doesn’t stop just because my husband comes home. Because of the nature of my husband’s job and my husband’s work ethic itself (which I understand), I don’t always get a break when I need it. So being able to reflect on the breaks I did have already and to look forward to breaks I will have soon help me to stay joyful during my mothering duties even as they extend into the evening hours. I do a lot of the obvious overworking to myself, especially since I don’t demand “me” time like some women do, but really it’s just the way it is. It’s the way it is with me, and it’s the way it is for a lot of other mothers, I’m sure. This is what mothering is, it’s non-stop, 24/7, on-call, never-a-break work. And work it is. But there is such reward in it, especially since I am learning to find peace and joy and fulfillment in it, which all flourishes all the more when I am able to consciously balance my work time with personal time. I soak in the beauty of the view of the woods out the windows and take in the simple scene of the cute cats and reflect on the very precious life of my two-year-old son. I find myself admiring the flowers and plants I keep near the window, and I seek to view the projects I work on as beautiful creations of myself, expressions of my personhood. This adds depth to my life and enhances my living a bit. While I work, I pray. I pray over the food I make, over the stuff I do. I pray for peace in this home, that it would be a sanctuary, and everyone here would feel love and give love. I thank God for my blessings. I have a vision for myself and my family. It helps guide my choices and actions each day. I want to be the kind of mother who plants wholeness into her children and husband. I want to be someone through whom God can use on a personal, private, and practical level to touch the people in this household. This is more important to me than ever being known for anything, other than to be known by my children as their good and loving mother and by my husband and his good and loving wife. I want to end with “The Serenity Prayer” and three special scripture verses because these have been influential in my ability to go to God with my life instead of trying to handle it all myself. He gave me the courage to choose my first dream, which is to be a stay-at-home mom (and which I acknowledge is not necessarily every woman’s first dream), and he is giving me the privilege of fulfilling that dream every day. I trust him to help me to keep going and to grow the seed of faith that I planted in him. “Trust in the Lord with all your heart and lean not on your own understanding; in all your ways acknowledge him, and he will direct your paths” (Proverbs 3:5–6). “Commit everything you do to the LORD. Trust him, and he will help you” (Psalm 37:5 NLT). “A house is built by wisdom and becomes strong through good sense” (Proverbs 24:3 NLT). 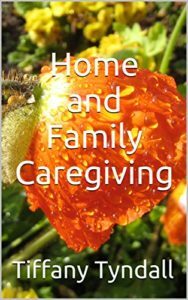 Home and Family Caregiving by Tiffany Tyndall is available for purchase here. 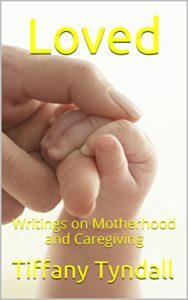 This writing is also included in Loved: Writings on Motherhood and Caregiving, a collection of reflective and expository writings by Tiffany Tyndall.